Mocean Mobile Advertising platform allows Mobile Operators to make use of its existing subscriber profiling data source and utilise its existing mobile service delivery mediums as a foundation to start providing advertisement delivery to mobile subscribers. With the platform’s Advertising Management feature, Mobile Operators can choose to use the system for its own branding and marketing activities or open up this channel to external advertisers as well for additional revenue. 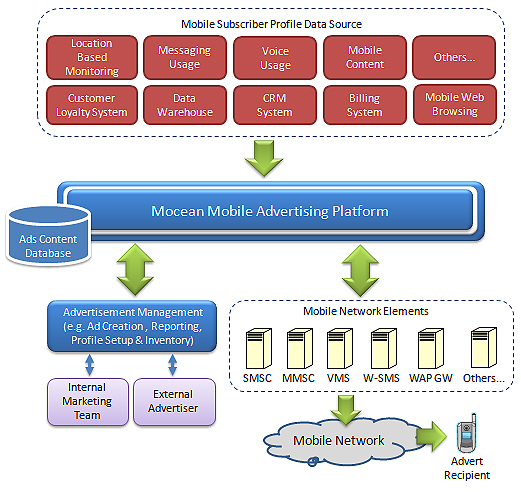 Mocean Mobile Advertising platform supports multiple advertisement delivery channels with its capability to interface to different network elements. Since SMS is the most prevalent used service by mobile subscribers, Mobile Operators can start providing mobile advertising via this channel. Mobile Operators are now sending many types of notification messages via SMS such as Missed Call Notification, Welcome SMS and Voice Mail and these messages usually have sufficient unused spaces that can be fully utilised for mobile advertisements. The result upon subscriber’s interaction to the adverts can be pure text messaging based or multimedia (MMS, WAP links). Mobile operator can also choose to send direct mobile advertising messages at targeted recipients without having it being inserted into network notification messages. This can be done in conjunction with the integration with the Mobile Operator’s existing subscriber profile data source, which provides a very good and ready profile for successful targeted campaigns. Being a modular in design, additional functional modules can be developed Mocean Mobile Advertising platform to cater for new elements in the operator’s network, making it a good long term investment.